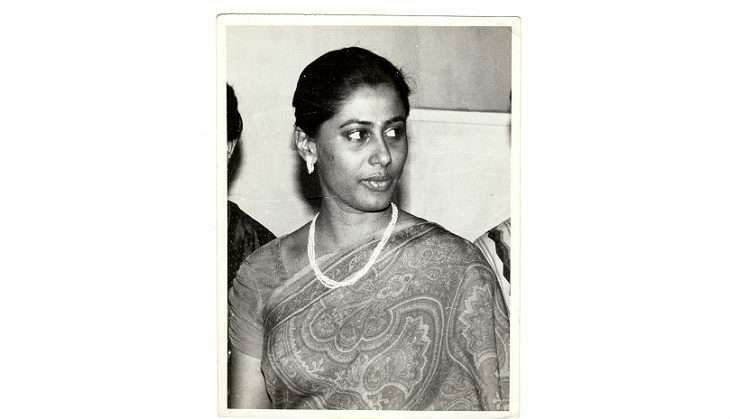 I shot this picture of Smita Patil at the launch of a film in which she co-starred with Raj Babbar and Meenakshi Seshadari sometime in the late 1980s. I hugely admired Smita's work in Arth, Subah, Mirch Masala, Mandi, Bazaar et al but the film that left an indelible impression on me was Bhumika (1977). In a fictional representation of the life of an actress (Hansa Wadkar) who flits from one torturous relationship to another, Smita Patil was at her searing, heart-rending best. In those days, there were two fan-based camps, Shabana Azmi and Smita Patil. I belonged to neither because I like performances rather than actors. But my brother Sunil was clear - he saw Namak Halal (1982) 20 times, albeit only till the song 'Aaj rapat jaaye,' in which Smita had a field day dancing with Amitabh in the rains, appeared on screen. The moment the song ended, Sunil would exit from the theatre. It was my ambition to interview Smita. Lore has it that the actress, who began her career as a TV newsreader, would grin when people complimented her on looking lovely in the saris she sported for the telecasts because minutes before going on air, she would hurriedly wrap the sari over her jeans. I wanted to ask her about this and a lot more, but there were many a slip between the cup and lip before I finally realised my dream. I recall dropping in on the sets of Dev Anand's Anand Aur Anand at Mehboob Studios in 1984 in the hope that she would do an impromptu interview with me. Smita was busy but friendly ... I was amazed at just how affable she was. When she noticed a female journalist wandering distractedly on the sets, she asked, "Why are you flitting around like a bee?" The girl pointed out, "There are no chairs" and Smita instantly smiled and said, "Come, share the stool I am sitting on." I met Smita last just weeks before she died due to complications in child birth in 1986. It was at BR Chopra's dubbing studio in Juhu and Smita was dressed in a loose, flowing all-black dress. I am not superstitious but I got a premonition of doom. Mid-way through the interview, she said, "I was supposed to send the car back to Raj (Babbar, her husband). I have to leave." Fortunately, she suggested I drive with her so that I could complete the interview enroute. A few weeks later, I was attending the star-studded Hope '86 show put up by the film industry in an open air stadium in town, and midway through the show they announced that Smita Patil was no more. A pall of gloom shrouded the show thereafter, the sorrow amongst the gathered industry folk was genuine and palpable. I can't help thinking of Geeta Bali, Madhubala, Divya Bharati and Smita Patil when I hear the lines penned by Indeevar for the film, Safar, 'Aise jeevan bhi hai jo jeeye hi nahin, jinko jeene se pehli hi maut aa gayee, phool aise bhi hai jo khile hi nahin, jinko khilne se pehle khiza kha gayee'. Also read: #CinemaSnapshot: When Deepti Naval was told she should smile more often!